"Probably the most forceful and driving writer of thrillers in England." "A first-rate thriller but above all, it’s a terrific novel." James Bond meets a London Jeweller who deals in diamonds – it’s a special excursion that Customs have arranged for him. They know that diamond smuggling on a commercial scale is being carried on and they think this man might have something to do with it. All they have to show so far though is one of the couriers who is supposed to pickup in London and deliver to America. Bond is just the man to track down the pipeline that so efficiently feeds the illicit goods into the marketplace. Even so, ‘M’ has reservations about putting 007 at risk and at the mercy of ruthless mobsters in the USA – the notorious Shady Tree and Sereffino Spang - who leave nothing to chance. Tiffany Case is who they have chosen to chaperone Bond as he sets out to impersonate their courier. Glamorous and, as Bond discovers when he meets up with Max Leiter from the ‘old days’, she ought to be freed from a hidden past. In the meantime, diamonds, fast fillies and a serious gamble all figure before Bond takes in the thrills and spills of the Wild West. Diamonds are small and valuable – tempting for the miners to liberate one or two on their own account. That’s why security at the mines is high; detection is pretty much assured. But more than miners are employed on-site. One way of smuggling diamonds out – go visit the dentist and let him collect the illicit stones. He’s a trusted employee. He is also the first stage in a pipeline that takes them out of the country, turns them into valuable merchandise and distributes them into the market place. It has all become far too professional and too much is going astray. The question is how is the pipeline organised. So far there are only suspicions but now one of the couriers has been intercepted. James Bond is the man to carry off an impersonation and gather all-important intelligence to close the operation down. This will be no walk in the park, no ordinary mission for a ‘double O’. Has Bond got the balls for it? Seems so. Eighteen Dunlop D65 golf balls to be precise. He got away with it. The only concern it seems was the safe arrival in America of the diamonds. Transit arrangements were simple - Bond was under the watchful eye of the delightful Tiffany Case every step of the way. What surprises him is to find Felix Leister working for Pinkertons, the famous detective agency, on the trail of the same ‘mobsters’. It’s time for James to be brought up to speed about the activities of organised crime ‘US’ style. This mob show no mercy to anyone who doesn't follow orders and you can add horse racing scams to their list of 'business' interests. 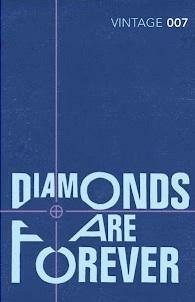 All of which sees the payoff Bond is due, as successful diamond courier, thrown into disarray. Now his money will have to be laundered through one of the casinos they own. The instructions are very specific, down to the card game, the table and the time of day. Oh, and that is the only gambling Bond is expected and permitted to undertake. So he too is under orders – maybe getting just one step closer to the kingpins of the organisation. Who is the dealer with the refined sleight of hand that will deliver the money to James Bond? Enter Tiffany Case, who, when she is not flying the Atlantic, is kept close to Seraffino Spang and his gambling empire. She plays her part, James gets the money he’s due but won’t let it rest at that. Underneath the edgy exterior this woman has a history that makes her a ‘damsel in distress’. Time for 007 to see what the opposition are made of and make something happen. It’s a gamble that pays off but there is a price to pay. No-one ignores orders if they work for Mr Spang and Bond is a marked man. He’s tailed and someone wants him terminated. Little chance of that, as they find out soon enough. Then it is time to hide in plain sight, next to a hundred other cars at a drive-in cinema. Has he done enough to flush out the Mr Big…and will he meet up with Tiffany Case again? What will it take for James Bond to find the other end of the diamond pipeline, derail the whole smuggling operation and come out alive? © 2019 Mike Norman All Rights Reserved.